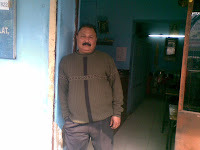 In my salad (college)days, Sanjay Mathur.. a friend went to Kyoto, Japan to visit his parents (living there). He came back with a story, explaining the inabilit y of Japanese, to speak in English. He imitated, Jaapaan iiis an aailand, so we can eat raw fisss. Any time I think of Fish, These words come ringing in my head. We did not eat raw fish or Sushi, we ate the Mackerel or Bangda in Kerala style, in a Kerala restaurant, like you would find it in a Kallu Shaap (Toddy Shop) around the backwaters of Allepey. It wa s in heartland Kalkaji, in a erstwhile Punjabi refugee neighborhood called simply DDA Flats. This mean little Kerala restaurant was elusive, I found it with walking around and asking, I had spotted one a few years ago, but it moved when I went back. In fact have seen a few more appear and vanish. 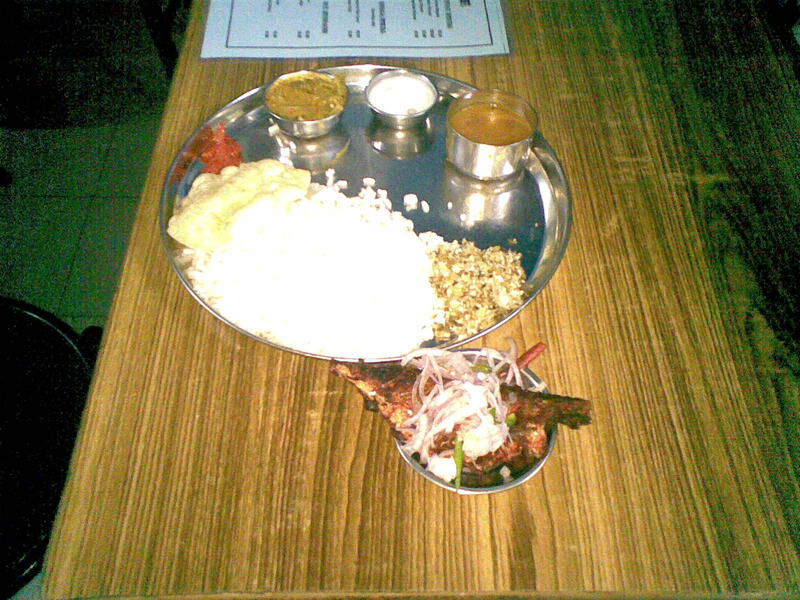 They are in the category of the Kerala Restaurants in Gautam Nagar (near Green Park in Delhi) and Julena (Okhla, near Escorts Hospital). I have written about them earlier. Arun Alex Paul (the man who got me started , blogging), and I, constantly, were unable to vist the place and sink our teeth into the grub. We in turn eluded this palce nearly for 5 months. One very warm evening a week ago, we had to bite the bullet. In this case, bite the mullet, sorry mackerel. 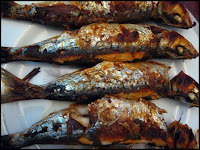 However, the worlds taste for fish are changing, they like, like everything else, more and better, similarly with fish. The last sardine cannery in USA shut in Maine , after 135 years last month in April 2010 (Stinson Seafood plant in Goldsboro in Maine), sad. Once, a mainstay of world cuisine, with idioms, packed like can of sardines and Enid Blyton, Famous Five feasting on Biscuits with Sardines and Lemonade. The famous John Steinbeck classic Cannerry Row set around Monterrey Bay. All these, indicate a healthy market and business for the foraging fish the humble herring, sardines and similar small fish. Our God (Anthony Bourdain, often addressed affectionately as God among us food writers) declares Sardines, as his favorite fish. Despite all that, its, dying gourmet .But , my recent experience had nothing to do with Monterrey, Maine, Steinbeck, Blyton or for that matter Bourdain. It’s about Tommy in a chaste Mallu accent it’s more like Taommi, the owne r of two houseboats in Allepey and this working class eatery for bachelor Malayalis (men folk from Kerala), some foraging a livelihood in the mean mean city of New Delhi. Sounds good foraging fish for the foraging worker. As a Salesman, you are always foraging, remember. 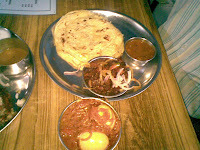 Let’s cut to the meal, Me and Alex and Taomi in attendance, we order, a Vegetarian Thali with a fried fish (turns out to be a mackerel the star of this post), three kerala parothas (soft and chewy), a beef chilly fry (spicy,served with a flavorful complementary gravy), a plate of egg curry (with two devilled eggs, crowded with rings of orange semi cooked onions), yet another mackerel and bottle of mineral water. All for a handsome price of Rs185/- Yes ! Yes! 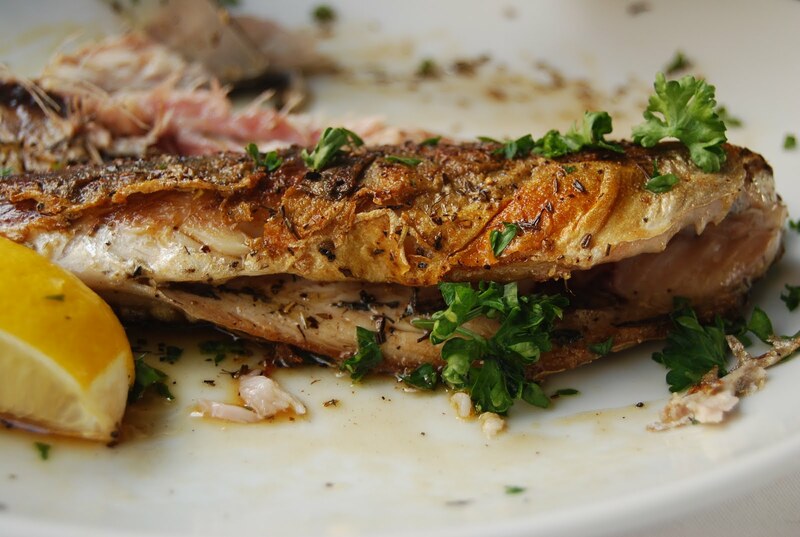 Cut To the mackerel, soft, marinated, flesh, falling of the bone, fresh, seldom does a dish so simple a nd humble move you like this moved me unexpectedly. I was singing and sweating at the same time. Kudos to Taomi or his Uttaranchali Chottu. But the food was nice. I would leave it to Alex, to add the review in t about the rest of the stuff as his comments. But the the next evening Alex was back there and eating , guess what a Thali and Fried Mackerel and he messaged this may be a start of something new. So do you have a recent and interesting Fish story, I would love to hear it. 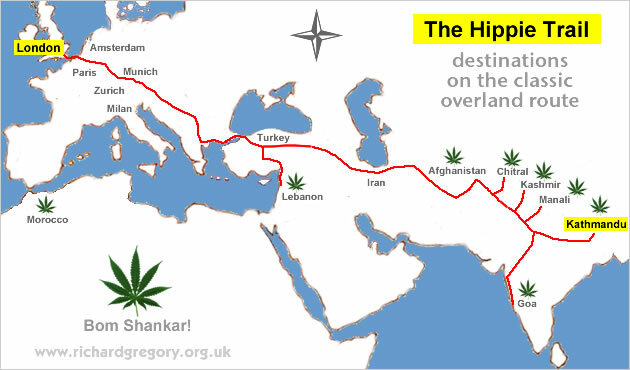 Richard Gregory travelled (at age 19) from the UK to India and Nepal on the legendary Hippie trail that comes to Paharganj in New Delhi. London- Amsterdam- Munich- Istanbul- Tehran- Kabul, Delhi (and branches out to Kathmandu and Goa ). I enjoyed his memoirs of the trip taken in 1975, recorded nearly 30 years later from his memory. Delhi ! Paharganj was and is the place in the 60s,70s, 80s and even now in 2010. Though Cafes like, my favourite, Don’t pass me by, at Scindia House Connaught Place and the Ringo Star Guest house in the same building are gone and are a shade of their past glory. Paharganj continues to survive and perhaps thrive. I had to go to Pahar Ganj to absorb the atmosphere, it’s been a pineing desire. The interest heighten ed even more, when I read about the place in newspapers, magazines Like Time Out (often describing the exotic Korean Restaurants and bars). Made a few, futile attempts. Then we see, Dev D by Anurag Kashyap that makes Paharganj look like the Pudding shop Of Istanbul, Thamel of Kathmandu , old Manali and Anjuna at Goa all rolled into one smoking cigar and available at Paharganj. Yes I went to Paharganj, not for the muesli and banana lassi/ bacon and eggs breakfasts, or the minute steak and beer at Metropolis (a 75 year old restaurant with Continental food, that’s another story for another day), not to eat exotic Korean food or even to smoke the pipe peace, or even hire an Royal Enfield motorcycle . I have to sheepishly confess, I went there to eat the humble Channa Bhatura at Sitaram Dewan Chand. 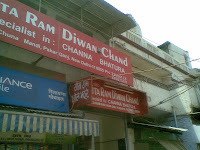 (Near, Imperial Cinema, Chuna Mandi, in Paharganj). Lots has b een written about this 60 odd year old establishment, by Rahul Verma, Hemanshu Kumar and lately by Pamela Timms on their blogs. So there is really not much to say, that’s a find and entirely new. 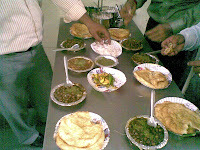 Well one can say a lot about the lovely Channa Bhaturas. Channas are nice deep dark, flavorful. The bhaturas are good and travel easily and don’t go bad or soggy, even at the restaurant, they served pre- made bhaturas (sacrilege in other places, here no one seems to mind). We asked for freshly made bhaturas and got them, the add on of the Aloo subzi is nice and the accompaniments, the raw mango pickle, the masala green chili and onions are great. A great combination, for Rs 28, for the Channa bhatura and about Rs 12 for the Aloo subzi. And you’re ready to run cool on heavy heavy Fuel. I ask Pawan Kohli the owner (with his rotund son, the cashier), where is a good lassi, he says avoid it, after, channa bhaturas, lassi, you will get packed (in chaste Punjabi). Honestly a cold lassi after greasy food turns it into sludge. Well, we were ready to take the risk, we walk down to the Lassi shop. Before that, a quick round up here. Sitaram started a push cart at DAV school in the late 40s and in the day moved his push cart around Paharganj and sold the exotic food to traders, the people and residents. Later they acquired a shop with Dewan Chand (two schools of thought, his son, or worker who later partnered and owned the place). 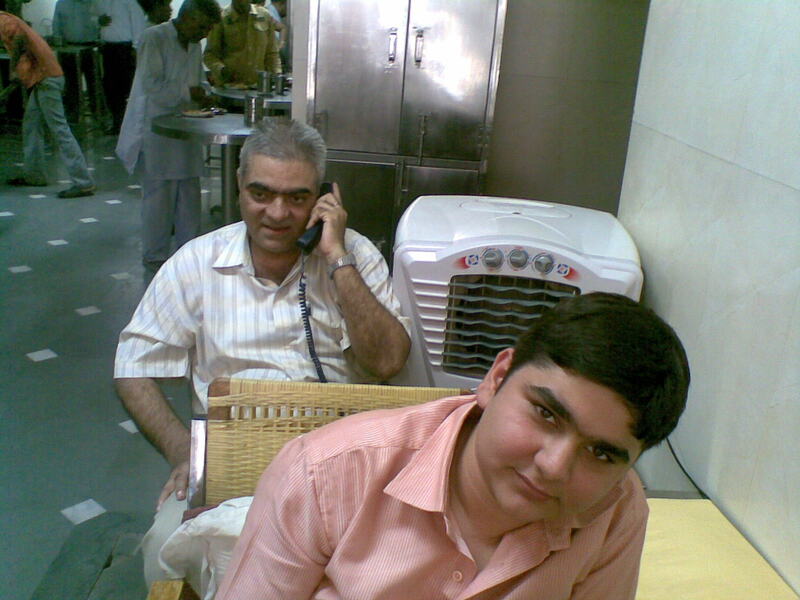 Now passed on, to Pawan Kohl and his rotund son. 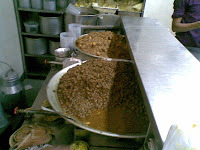 In all they pack in good punch and good Channa Bhaturas. But the best I have ever had were at Lajpat Nagar Market (now shut shop and they sell birthday return gifts, paradise lost, more of this sad journey on another day). Which makes us probe when and where was Channa Bhatura invented, though Kwality restaurant claims ownership, well they popularized the dish, now we know it’s been around much longer. The Lassi shop below the Metropolis Restaurant, has a heavy Israeli influence, sells Lassi, Mango Lassi, Apple Lassi, Banana Lassi, Pineapple Lassi, Apricot Lassi and on and on. We have sweet Lassi for Rs 15/- each. Nice Frothy. The own er , Mittal explains the subtleties of churned in a Churner Vs a Mixer and blender, I tend to agree Churned is better. We see talk drink and leave. With this trip I was back to my roots as a Salesman eating out after wandering the circles of IIC ( food talks with gourmet lauouts), back to basics, Lunch for 5 Rs 140 (with complementary Aloo Subzi) and Lassis' for 5 Rs 90 in all Rs 230 for Lunch, for 5 ( self , friend and driver Bhushan, Jitender Bakshi, Mukesh Sharma and youngster Saurabh Pandey). Thanks to Jitender Bakshi for taking us there. 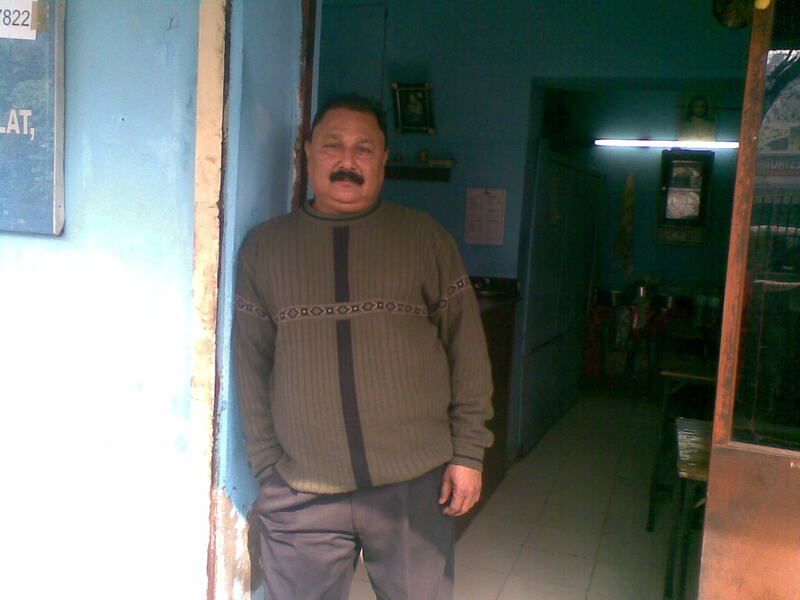 Now I am sort off Paharganj qualified. 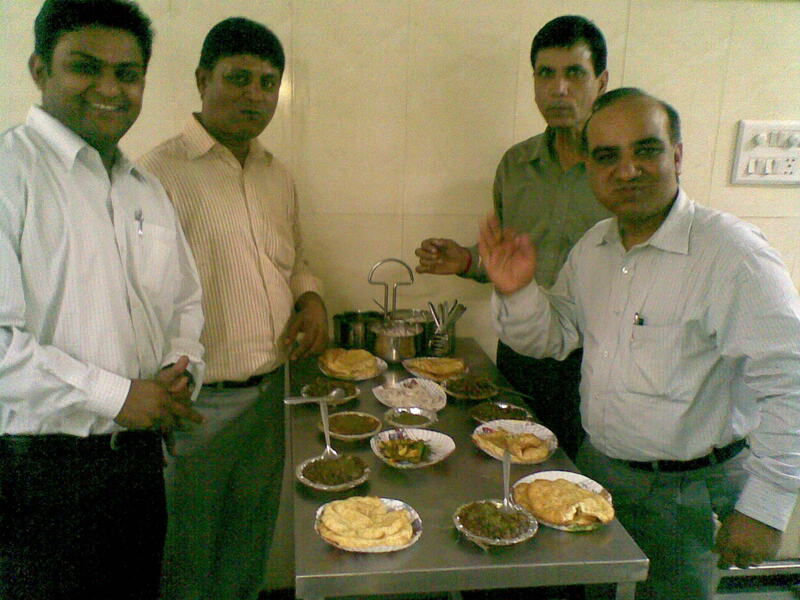 We ate well and well within the salesman’s benchmark of eating well for under a Hundred rupees. 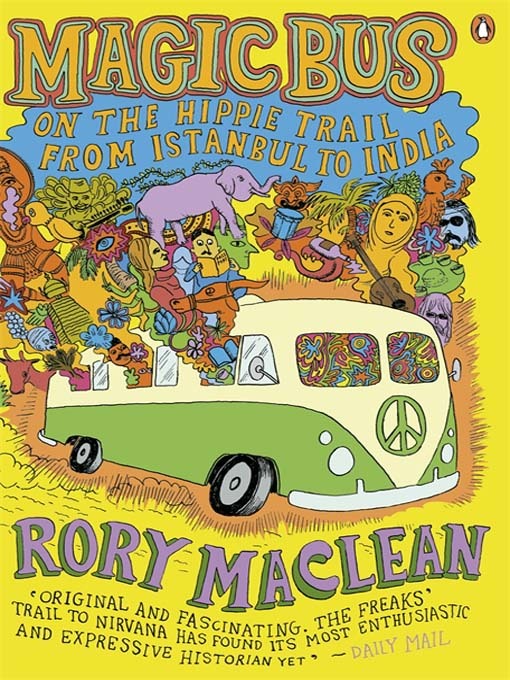 Footnote: My Favorite Uncle ( who lives in London since the late Fifties), Ranjit Kumar took the journey, right through the hippie trail in the 60s not on the Magic Bus but in a car. 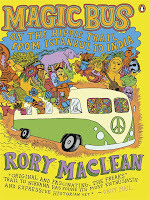 He gave the general trip story , but now I am wiser about the Hippie trail. The next time , we meet, I am going to extract the interesting details with a long and painful serious drinking session. 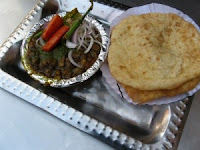 Please do share your Channa Bhatura story, I am sure you have one.